With the lightning-fast Thunderbolt port, you can connect your MacBook Air to the latest devices and displays, like the Apple Thunderbolt Display. But that’s not the whole story. MacBook Air also comes equipped with two USB 3 ports, so you can connect the latest USB 3 devices and all your USB 2 devices as well. With just a few connections, MacBook Air transforms from an ultraportable notebook to a complete workstation. Make FaceTime calls from your MacBook Air to an iPhone 4 or later, iPad, iPod touch, or another Mac running FaceTime for Mac. Corner to corner and pixel by pixel, the MacBook Air display is both an engineering feat and a design breakthrough. The display measures a mere 4.86 millimeters (0.19 inch) thin, yet its resolution makes you feel like you’re looking at a larger screen. 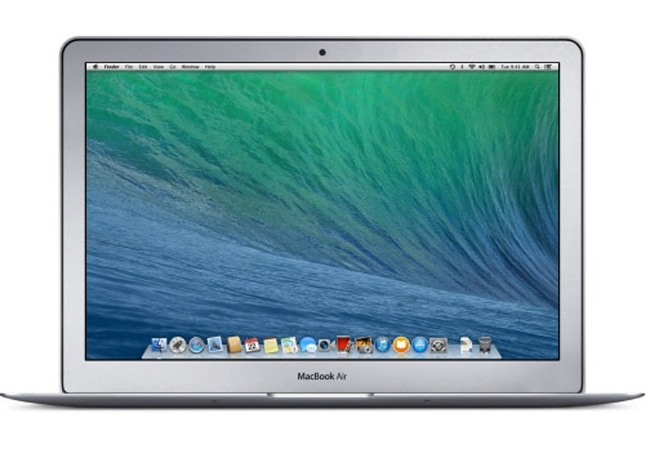 The 11-inch MacBook Air features a resolution of 1366 by 768 pixels, while the 13-inch model wows with a resolution of 1440 by 900 pixels. And LED backlighting makes colors bright and vibrant from edge to edge. So whether you’re editing photos, perfecting a presentation, or watching a movie, you’re going to love what you see. Let your friends and family see more of you with the 720p FaceTime HD camera. Every smile looks bright, even halfway around the world. And the widescreen format means everyone can fit into the picture without having to crowd around the display. The dual microphones in MacBook Air are great for when you want to be heard. If you’re making a FaceTime call, for example, the mics reduce background noise from behind the notebook. And when you use Dictation, they create an adaptive audio beam that intelligently adjusts to detect your voice — instead of the noise around you. The Multi-Touch gestures in OS X make everything you do on MacBook Air more intuitive, direct, and fun. And the spacious Multi-Touch trackpad is perfectly designed for them, whether it’s a three-finger swipe to activate Mission Control or a four-finger pinch to see all your apps in Launchpad. Gesture responses are smooth and realistic. So when you’re scrolling up and down a web page or swiping from one full-screen app to another, it’s almost like you’re touching what you’re seeing. Backlit keyboardA pair of stereo speakers is hidden underneath the keyboard. As incredibly compact as MacBook Air is, it still manages to fit a full-size keyboard that makes typing as natural as it is comfortable. And the keyboard is backlit, so you can type with ease in even the dimmest light. A built-in ambient light sensor detects changes in lighting conditions and adjusts the display and keyboard brightness automatically. From a seat in a sunny café to a seat on a cross-country red-eye, you’ll always have the perfect lighting for any environment. Intel Core i5-based 13-inch MacBook Air units and preproduction 1.3GHz dual-core Intel Core i5-based 11-inch MacBook Air units. The wireless web test measures battery life by wirelessly browsing 25 popular websites with display brightness set to 12 clicks from bottom or 75%. The HD movie playback test measures battery life by playing back HD 720p content with display brightness set to 12 clicks from bottom or 75%. The standby test measures battery life by allowing a system, connected to a wireless network, to enter standby mode with Safari and Mail applications launched and all system settings left at default.